I thank you so much for your interest in this historical blogging event! Be aware that new and exciting additions have been made to this event. For complete details please visit the updated announcement, which includes the complete roster of entries. Note also that the event banners have been updated. One of my favorite blogging events of 2014 was the Classic Movie History Project, which was the brainchild of Fritzi Kramer at Movies, Silently. I, along with Ruth of Silver Screenings, co-hosted the event with Fritzi and we’re all back for a bigger and better second edition. 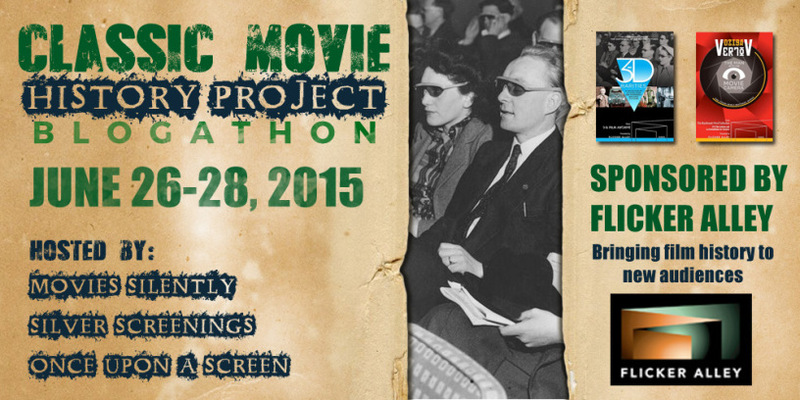 We are tickled to announce the second edition of the Classic Movie History Project. I am once again joined by my wonderful co-hosts, Fritzi of Movies, Silently and Ruth of Silver Screenings. We have divided the history of film from 1880 to 1975 between us. Fritzi is your Silent Era host and will be covering 1880-1929. I (Aurora) will be hosting the Golden Age from 1930-1952 and Ruth is our Swingin’ host and will be covering 1953-1975. We have divided our year ranges into bite-size sections, which are listed below. Pick your bite, tell us your angle and you’re in like Flynn! Hello! I would like to join in the 1880-1895 category. I want to cover Fred Ott’s Sneeze. My blog address is happypeppypeople.blogatron.com. We will each be hosting one day of the event in chronological order. Fritzi will be first, I will be second and Ruth will wrap things up. Complete list of participating blogs and topics can be found here. How about…. 1940-1945, Wartime musicals? My blog is The Vintage Cameo / thevintagecameo.com Thanks! Love that topic!!! Thrilled to have you aboard, Emily! Wonderful! Just let me know which topic in the Silent Era you think best fits. We can adjust as we get closer. Thank you for accepting! I was thinking about the themes of some movies, and how they would overcome the technical limitations. OK – for now I will list your topic under the 1908-1913 year range. Let me know if it is better suited for another year span. Thanks for joining us! Yes, that would great! I will reply with the exact topic tomorrow, when I have much clearer idea about it. Thanks for this, it is very exciting! I was thinking of doing a post about movies dealing with soldiers coming back from the war…the 1946-1949 Homecoming? Right now I’m thinking about THE BEST YEARS OF OUR LIVES and TILL THE END OF TIME, sort of compare and contrast. But I’m looking for more examples so that might change a bit. Would this work? I might even take a look at films from Britain too but I’m not sure. For 1939, I’d like to cover Laurel & Hardy’s entry, THE FLYING DEUCES. Hi! Could I do “1943 at RKO”? Count me in. I’m just not sure what topic to cover yet. Can we blog about a specific actor or actress or a particular movie? Is the title of your blog ‘Joanie1977’? Hi Aurora. No. My blog is called: In The Good Old Days Of Classic Hollywood. Yeah that was my old blog, but I never used it. Sorry, but can you send me the link? I think I’m going to the wrong page. Hopefully that works. I have a few topics in mind. Would I be able to cover two topics if I wanted to? I want to something in the silent era, as I’m fascinated in the early days and I’m also thinking of something from the 30’s or 40’s? Absolutely! Just let me know when you know. 🙂 I decided on one, but am thinking of another myself. Ok, I will start thinking of what I would like to do. Is anyone doing Carole Lombard?. I’m considering her, but haven’t decided yet? I listed a Lombard choice – Carole and Pre-Code – above. Otherwise, anything else you want to do. I was thinking in the way of Carole Lombard’s screwball comedies, but I’m not entirely sure yet. Would that be ok? I’ve got that in mind, and I’m also thinking of John Barrymore silent films and Ethel Barrymore’s transition from the stage to the screen by delving into her film career in the 40’s and so on. Not sure yet though. YAY! Yes, any topic – including film or person – that falls under the eras noted. Reach out when you think of your topic. In the meantime I’ll list you in the ‘Topic TBA’ section. Thanks for joining us! I would like to cover 1939: The Big Year. Selections from the biggest year in classic cinema. Smitten Kitten Vintage smittenkittenvintage.wordpress.com. Thanks!! I have been looking for a good reason to write about “It’s Always Fair Weather.” How about “It’s Always Fair Weather – The Musical Gets Cynical,” since it’s such a unique musical and it has an interesting historical twist as a satire on television. My blog is MovieManiaMadness.wordpress.com. Love it! Fantastic! 🙂 I’ll add you to the list later. Thanks! This’ll be my first blogathon contribution! Wonderful, Virginie! I’ll add you to the list in a bit. Thanks for joining us. Hi Aurora. For one of my choices I would like to do John Barrymore in “Don Juan” 1926 and the introduction to Vitaphone. Would that be ok? I will think of my second one later. That’s great. I’ll add you to the list a bit later today. My blog is : In The Good Old Days Of Classic Hollywood. I’d love to do a post about the making of “Son of Kong” in 1933. It was such a rush job, thought it’d be interesting to look into and talk about. What do you think? My blog’s The Stop Button. I’m not sure if I saw this category yesterday and it’s been taken or not. I’m big on the British New wave cinema esp. after it started blending in with rock & roll and youth culture. A favorite (and less well-known) example is “The Girl Getters” (aka “The System”) with David Hemmings, Oliver Reed and Julia Foster w/ cinematography by Nicolas Roeg. It’s from 1964 and is a good link between the earlier “kitchen sink realism” and the later Swinging 60s films. Please let me know. 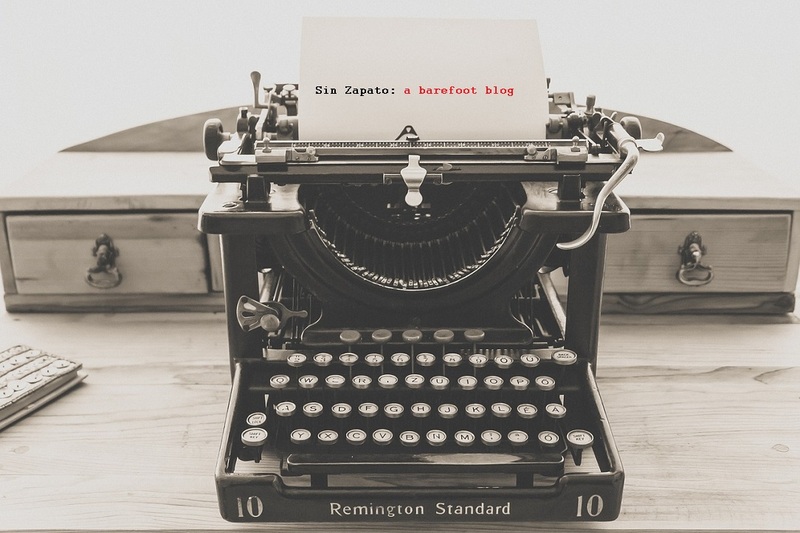 My blog is Reel and Rock. Hello, Rick. A category of British New Wave has been chosen, but a commentary on a particular film would be fine. It sounds great, actually. If that works for you I’ll add you to the list later today. Oh, and your choice falls under the last era so we will promote it on June 28th. It’d be great if you can have it published by the 27th. Not late at all! Love Batman!! 😀 welcome. I’ll add you to the list later today. YAASSSS! WooHoo. Er…I mean, certainly it’s OK.
Hi Aurora. I’ve made up my mind for my second choice. For that one would I be able to write about Ethel Barrymore’s transition from the stage to the screen? That would go under the 1930 to 1952 category. OK. I’m placing this topic under the 1930 sub-category. Thanks!! Never mind. Seems you submitted this to one of the other hosts as well. I’ll follow suit and place it in the 1932 category. Ok sure. Yeah it’s more so her transition to the stage and screen in 1944, so where is the best section for that? How about Wilder and Bracket: Kings that Watched the Studio System Burn (A Foreign Affair, Sunset Blvd, Ace in the Hole)? It’ll be about how the pair had total power at Paramount among the backdrop of the Paramount Decision and the subsequent end of the studio system. Their power and the desperation of the studios allowed them to make whatever they wanted. I LOVE, LOVE that topic! Fantastic choice!! Thanks, Aaron! Great! I’ll probably put up a piece about the end of the studio system beforehand and then work the films in. 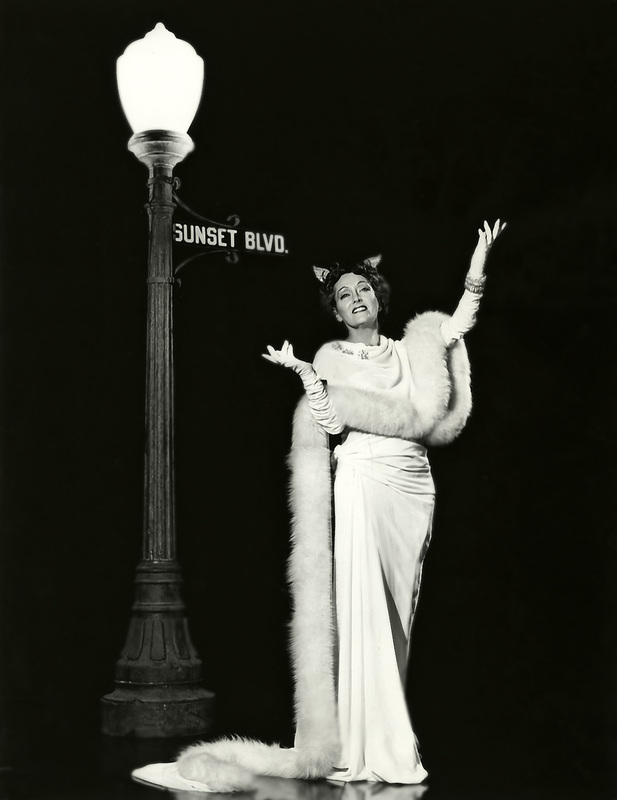 I know someone already chose Sunset Blvd, but it’ll be hard to cover this without much overlap. Hope that’s okay. Looking forward to it! I would LOVE to participate in this … I’d like to do something I haven’t done on my blog — discuss three movies released in 1969. Midnight Cowboy, The Sterile Cuckoo and They Shoot Horses, Don’t They? At least, that’s my choices now. I will definitely do Midnight Cowboy — I may have ideas for the other two, but I will check with you to make sure my final picks will work out. Actually, I need to tell this to Ruth, so I will do a comment on her blog. I’m so excited! I’ll be participating in my first blogathon and I’m certainly excited. I do love history and its connection to film. My topic is “It’s Always Fair Weather,” which is the most cynical musical ever made. So I told myself I was going to take a break from entering blogathons (was going to sit back and enjoy them instead)….but this is too good to pass up, plus it’s during the summer. I would like to do a piece on the early portrayal of taxi dancers: Ten Cents a Dance (1931) and Two Seconds (1932). Hey!—I’m changing my topic from the Great Dictator / To Be or Not to Be… to the development of newsreels, real life influencing Hollywood and vice versa, and presidential politics and policy in 1932-’33. That’s for secondsightcinema.com… and thank you so much for hosting this spectacular event! Not exactly PBS, although the local PBS station used to carry older films and provided some background once upon a time in the distant past. Change made! Listed all under the same era/time slot. I’ve been meaning to keep up on the blogathons I will be a part of by re-blogging for some time. It’s a habit I was not in long enough. Anyway, this is one I’m very excited to be involved in. I’m taking a small, but very important topic that paved the way for the motion picture before cameras even started rolling: The Muybridge Experiment. Can’t think of a title for my post yet though, but just comparing and how some of the love was maybe not so pure to begin with. Great! I’ll list you under that era with a temp title for now. THANKS!! Sorry MovieFanFare’s coming in a little last-minute to the party, but I’d like to get in on the historical fun. On Friday 6/26 I’ll be putting up a look at what the WORST movies from 1939 were (not everything Hollywood put out that year was Gone with the Wind or Mr. Smith Goes to Washington). I’d also added a blogathon banner to our home page. Thanks. .
Hi Gary! I’m thrilled you’re joining us and so sorry I didn’t reply sooner. I’m just seeing this comment now since we have an updated announcement. I’m adding you to the list. YAY!! The banners have also been updated to reflect the Flicker Alley sponsorship. Hi Rick. I’m just preparing the roster for tomorrow and just noticed I don’t see your link. Can you repost it? Yes, if you can. I’m unable to access it. Thanks, Rick! Got it!! Thank you! Your post will be featured in tomorrow’s section. Did you get the re-sent like this time? Yes! Replied. You’re good to go and will be featured in tomorrow’s eras. Pingback: So, What Were the WORST Movies of 1939?